“On the 30th September, the mobile platform for UAV antenna tests was officially presented to the company EADS-CASA, represented by Mr. D. Daniel Sánchez from the Defence section. Although it was already finished in the month of August, its presentation was postponed so as to incorporate additional features requested by the customer. Having carried out the appropriate demonstrations of the product in the Dynatech installations and having achieved an accuracy level much lower than 0.1º, EADS-CASA gave its approval for the transferral of the machine to its installations in Getafe (Madrid). 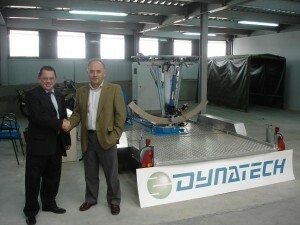 Recently Dynatech has strengthened its Technical and R+D Team thanks to the incorporation of highly qualified staff. The aim is twofold. On the one hand, to encourage the development of new products in the elevation world, more innovative and better, and on the other hand, diversify the company’s activities in other sectors, basing on a strong engineering, as a key factor to maintain a solid and steady growth. A consequence of these efforts is the inclusion of Dynatech in the suppliers list of an important European group, EADS, in its Defence & Security Division. EADS-CASA Systems Integration Department has commisonned us to manufacture a mobile platform for testing UAV antenna. The system consists of a platform with three degrees of freedom of movement (azimuth, pitch and roll) driven by electromechanical servo actuators and with a payload of 350kg. The motion control is achieved through the combination of an industrial PLC and a conventional PC connected to it via serial RS-422. The platform will generate preprogrammed movements, so the EADS-CASA technicians can verify the effects that these movements produce in the UAV antenna transmissions positioned on the platform. This project will be done in a relatively short time. The delivery of the platform has been agreed for August. Dynatech believes that the proper functioning of the platform coupled with a rapid execution of this project may allow us to become a steady supplier of EADS Group, and therefore, broaden our range of activities in a highly qualified sector, the aeronautic.